Commissioned by Bloomberg financial center. We produced a series of four pieces of one minute each, designed to be displayed on a 8 meters wide screen in Bloomberg’s European Headquaters, in London. Set in Hamstead park, Break was an escapist projection of the idea of ‘coffee break’: Dressed up in business suits, the dancers performed a slow, smooth, yet very technical choreography, with difficult lifts and jumps in a natural environment. The overall effect is both relaxing and humoristic. It counterbalances with the stiffness of the building’s architecture where the film was displayed. A Brief Encounter is a 30 seconds film set in seven different locations in London. The film is the -short- story of two young people who bump into each other and engage with a tango-ish crescendo chasing in the city. 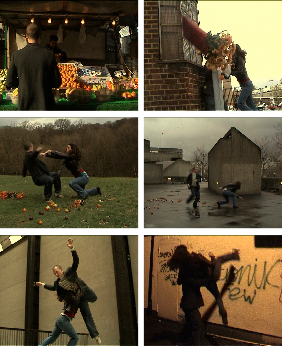 The choreography is continuous and cut on the move, so that the dynamic of the angles and the editing connects the various places in one cinematic space. Light meets chocolate is temporary installation and live performance for the opening at the Aram Gallery “Under the Same Roof” exhibition on Wednesday 17th of September 2008 in London. A tasty chocolate feast was unveiled and consumed by the exhibition opening visitors. 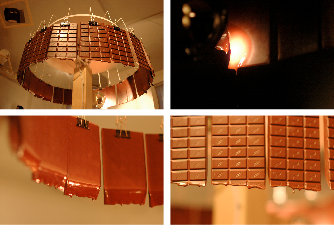 In Chocochandelier, 24 bars of chocolate rotate around the spot light at one revolution per hour. The light is slowly moving up the arrangement so that it continuously melts sections of the chocolate bars hour after hour. People are welcome to catch the chocolate drips using the supplied bread sticks or their fingers. A day in the Life of a Design. This was a short promotional Video/Animation made while working at Established&Sons. It documents a day in the Established&Sons Design office. 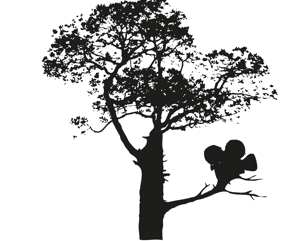 This is a selection of early Video Art and Dance films. Some of those early experimental projects remain an inspiration for later projects.